The day before preparing the casting yogurt, depending on the type of yogurt and whey containing may need more or fewer may be needed about 8 yogurts (the amount used by diners can vary. Prepare it as explained in the post Labneh . Before wringing you can be sweetened if desired, although the longer handle coulis sweet. Peel the mango and cut into pieces, recovered the juice can drop and add the fruit and its juice in the bowl of the mixer. Add sugar or sweetener, can put less of the indicated, it can help to be removed. It also incorporates the mint leaves and lemon juice. 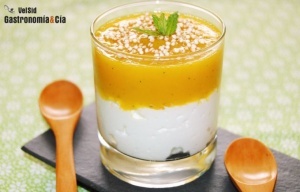 Ground into a light sauce of mango, try it if you need more or want sweeten enhance the flavor of mint, you can even go well add a pinch of salt. 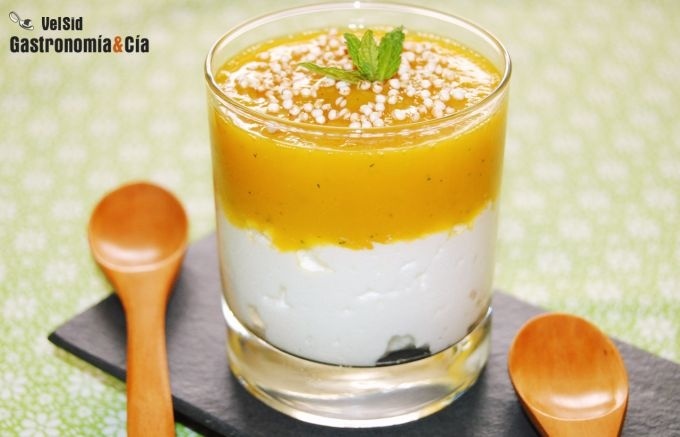 You can present the yogurt with mango and mint in small glasses, distributing first casting yogurt will be very creamy and dense, like a cheese spread. Pour this sauce over mango, it will be very smooth and well combined in every spoonful. Covering ends with some quinoa or a swollen chopped nuts, plus a small mint leaves.